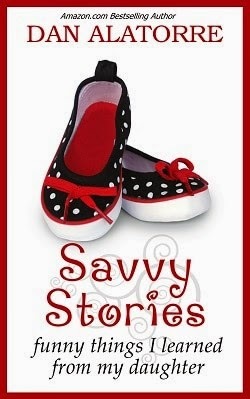 Today we are interviewing Dan Alatorre, author of "Savvy Stories: Funny Things I Learned From My Daughter." I’m a Best-Selling author and humorist; my brother points out that a humorist is a writer who’s not funny enough to call themselves a comedian. Gotta love family. I turned my sights on fatherhood in “Savvy Stories,” and the results were hilarious. I was just a normal guy until I became a first-time dad at the age of 47 - when most of my friends were becoming grandparents or sending their kids off to college! Some will argue that I was never a normal guy, but nobody will argue that the addition of a bouncing baby girl changed my life. My comedic debut book "Savvy Stories" tells humorous tales about a loving dad who sees the magic in children, and isn't a bumbling stooge about changing diapers like some TV sitcom. I followed up the success of "Savvy Stories" with the even better sequel "The TERRIBLE Two's," and my inspirational book "The Long Cutie," which deals with life affirming stories about people with a rare heart condition. My success has been widespread and varied. I became a bestselling author (it was a slow sales week at Amazon) and I have achieved President’s Circle with two different Fortune 500 companies (can you believe that?). But I have always been a writer. I wrote cartoons as a kid, created a newspaper at my grade school, was co-editor of my high school newspaper… I had a desire to tell unique stories in an amusing way. I’m glad my smart aleck sense of humor has found a productive outlet. I’m sure my sarcastic mouth could have just as easily gotten me killed and buried in a shallow grave. Currently in the works are “FOURthcoming,” the conclusion to the Savvy Stories series, “Chase Me Until I Catch You,” a nonfiction romance short story, and “The Adventures Of Pinchy Pinchy Crab And Ramon D’Escargot,” a children’s novel, and others. “Savvy Stories” is a heartwarming comedy about a 47 year old man who discovers that he is about to become a father for the first time, and after getting over the shock of having a baby in the house, learns to see life through the eyes of a child. He comes to appreciate and enjoy the many hilarious things that all kids say and do, and creates a lifelong daddy-daughter bond that every parent can appreciate, and that every dad of a daughter should strive for. After all, men were little boys once; we know that territory. Having a little girl is uncharted water. We feel sure we’ll screw her up. Who do you think would appreciate your book? I’m surprised anybody does. Oops, did I say that out loud? I meant to say everybody does! This is a book that men and women both enjoy. The parents in the story are real, not idealized; they do real things like shop at Publix and Target, and they do a lot of stuff that we can all look back on and laugh about. Like when the kid discovers a Sharpie marker and writes all over the cabinets. Most of us have kids or were kids once, so we know there is a lot to laugh about. Women have said they appreciated the viewpoint about babies from a dad, and men have said the book was like I was writing about them. Pretty much everybody agrees it’s funny, even people who haven’t had kids. And more than a few have given it as a baby shower gift. When’s this interview coming out? It makes a great Mother’s Day gift, too! And Father’s Day! Was there an epiphany that revealed you had to write a book about your fatherhood experience? Or did you gradually come around to the idea of writing your book? First, that kids are flat-out freaking hilarious if you are paying attention. Not just my kid, but every kid. A hundred times a day there are amazing moments that come and go so fast - and we’re too busy to take note or to remember it later. I just happened to write some of it down. Second, they grow up fast. I was 47 when Savvy came along. We had infertility problems so we were especially appreciative to be having a baby at all, but also because I was older I had a different vantage point than most dads at age 22 or 25. My father and my brothers came to me and said, “We missed it, we were working. Take time to savor every moment because if you blink twice you’ll be walking her down the aisle.” Strangers would come up to us in grocery store after a particularly grueling night – I’m sure our weary expressions said it all - and they would tell us, “Enjoy these moments, even the difficult ones.” It sunk in. So I knew that it all happens fast. It doesn’t seem like it when you’re up at 3am feeding a cranky kid who won’t go back to sleep. But we made that our time. We found ways to make it fun and special, and to realize that one day she’d be off to college and I’d wish I could have another moment with her like this, just me and her, at 3am playing a game of peek a boo. On that day, I’d wish I had this day back. So I learned to love those times. I could never have figured that out when I was twenty five. As I posted about this stuff on Facebook, friends were constantly telling me it was hilarious and that I should write a book. I resisted, but at some point you have to trust the people in your life who have your best interests at heart. So I wrote a book - and it became a bestseller. How do you think the perspective of fatherhood that you share in your book is different from other portrayals in the media? Most dads on TV are bumbling stooges. Mine wasn’t; was yours? Still, it’s rare to see a man step up and say “I can be a great father and learn about gymnastics with my daughter and take her to dance lessons because I love her.” I can make time to blow bubbles on the back porch. It doesn’t cause your man card to be revoked. Also, in the book you see some very real, very personal moments. The first week of Savvy’s life was the longest week of ours. We spent five days in the NICU (Neonatal Intensive Care Unit) worrying that our newborn daughter might die. It was touch and go for a while, and it was extremely difficult to write about. Chapter two gets a lot of people crying. But because we put that honesty out there, readers said “Okay, I can trust this guy.” Then they were better able to laugh with us, too. Do you think your experience of being a father is different, having had your first child at 47, than it would have been if you’d had your first child at a younger age? There is no doubt. I have a nephew whose son is a year older than my daughter. Our worlds are just so completely different. He’s a good guy and a good dad, but it’s a different perspective from what I’m looking at now that I’m fifty. And it should be. He’s building a career, I’m 20+ years into mine and established. He and his friends still party and go out to bars. My wife and I have friends over to the house and are lucky to stay up past 11pm. Okay 10:30. Humor is a large part of your book. Has humor always been a part of your life or did it develop as you got older? I came from a large family – seven kids – and I was next to youngest. So to get noticed, you had to stand out a little. Growing up, I had a sibling who was an athlete, another who was a scholar, another who was a musician; I was the smart aleck, and it got positive attention if it was funny. So I always appreciated that and did a lot to get that recognition, even at school. I wasn’t a class clown, because my parents were very strict and because nuns in general have no sense of humor. I mean zero, zip, nada. I wasted some of my best stuff on those old hags! Look at these knuckles - those are ruler marks, and they’re still visible all these years later. But I could usually get out of trouble at home if I could get my mom laughing. That’s a huge ace up your sleeve as a kid. How would you describe your writing style? Are there any authors who have influenced your writing style? I have what I’d call a lazy writing style. (My author friends would say there’s nothing lazy about me, that I’ll bang out 3000 words in a day or write 110,000 words over seven weeks, but that’s different.) I write most of my stores the way people talk, complete with an occasional run-on sentences and stuff that seems to go around in a few circles before making its point. In a comedy, you can do that. Readers get it, that’s part of the joke, the way Mark Twain used to ramble on, or Bill Cosby in his old LP recordings. There’s some deeper satisfaction to not requiring a joke every 90 seconds like a sitcom and just letting a laugh build – and I have no grudge against sitcoms; done well, they’re great entertainment. In my dramatic stories, my style is very different; it’s tighter, but my characters still talk the way normal people talk. They argue, they are sarcastic with each other, they joke around. I usually end up with one outrageous minor character in each book that people just rave about. We all have that one friend who says and does things that are a riot. A character like that is the salt in the soup: you want just enough to bring everything to life. If you get a writer to be honest – and that’s hard to do because they are shy, sneaky types – but under cross examination they’ll admit they’re like the kid who wants to be a firefighter and a police officer and an astronaut. Writers have a dozen ideas they’re working on. I have the final book in the Savvy Stories series written, called “FOURTHcoming;” a sci-fi thriller “The Navigators,” and a paranormal mystery “An Angel On Her Shoulder.” Those are finished, they’re just being edited and maybe need a few final tweaks. I have Dr. Seuss-like kid’s book written called “Stinky Toe” and we are looking at illustrators for that. In process I have a romantic comedy called “Poggibonsi” about a man who has a midlife crisis while on a business trip to Italy - and it’s a scream. Some of my funniest characters are in that story. It’ll be finished in about two months, maybe less. Upcoming we have “The Water Castle,” a fantasy about a young lady who discovers a portal that takes her back in time; there is a sequel to “The Navigators,” a mystery thriller called “The Kill Club,” a romance called “Chase Me Until I Catch You,” and maybe most importantly, a book series for authors that shows how to market a book. Those are all in various stages of being written. Like I said, a firefighter and a police officer and an astronaut… It’s a sickness. I’d like writers to know that my first bestseller was a cookbook, so remember to be open to trying new things. From that experience I learned things about marketing a book that benefitted me greatly and, combined with my sales management experience with Fortune 500 companies, I was able to launch a string of bestsellers. (My marketing book will show new authors some of the things they need to do to be successful.) I’m proud to say I’ve helped several authors take their books from ideas to reality. One friend released her book in February and has already sold over 2000 copies and has 30+ positive reviews. It’s a great book, and I played a small role in helping it get to many people who have enjoyed it and who are now fans. I’d like readers to know that I’ve been very fortunate to have been able to share my stories with so many people around the world who have enjoyed them. One friend says that if you read a few paragraphs of Dan’s work, you’ll read the whole book. I write stories that anyone can enjoy, and I like hearing from fans. It is deeply moving to read a letter from Spain or somewhere that says they read my book and fell in love with my daughter. Or that a book I wrote changed their life. It is amazing to be on the receiving end of that, and I will work hard to continue to earn it each and every day. The other family sees me piling the prepared meals into my cart, and has obviously noticed that I’m getting food that’s below my kid’s eating age. That is, I’m buying stuff for a 9 month old – mostly pureed – instead of the stuff with big chunks. “Sure,” I reply, smiling. Usually I would have ignored them because I’m not there to make friends or defend my purchase selections – which I agree is rude and unsocial; but I have experienced the Publix Meltdown twice by now and I need to be able to buy groceries somewhere. I can’t afford to scratch Target off my list, too. But for some reason, I am feeling friendly and confident today, so I turn to engage these nice folks in conversation. She was about as polite as a person could be while questioning your nutritional decisions for your kid, but what she was really doing was asking why I’m buying stuff that’s mostly pureed for a kid who has teeth. The dad is doing an end zone dance behind his wife, smiling from ear to ear; the mom is displaying a look of passive acceptance. I suppose this is what they had been discussing – arguing, for those who’ve been married a while – and he agreed with me, which made it 2 to 1, and since she was outnumbered, she agreed to get the stuff that their kid could actually eat.